I dedicate this journal to all those people who would love to keep a marine tank and also to all of my lost fishes ( RIP ) & also the money that accompanied them. This hobby is surely a race track for the rich. I have heard some stories that talk of expenses big enough to help procure an apartment flat or two. Now, does it have to be that expensive ? Well, ... I guess its like sports cars. NEED FOR SPEED. Both can crash. But, no. Even the poor can own cars. It doesn't have to be a reef tank for me to call myself a saltwater hobbyists. Yet, who wouldn't like to stare at one. We all do. Keeping in mind all the limitations that fate and nationality has gifted us with, my first idea told me to have an anemone tank. This way I could at least enjoy its symbiosis with clown fishes. But, what if I could not afford even that. Then it would have to be a mere fish-only-with-live-rocks tank. My humble submission is that that is what I did and I can live with it for ages to come. 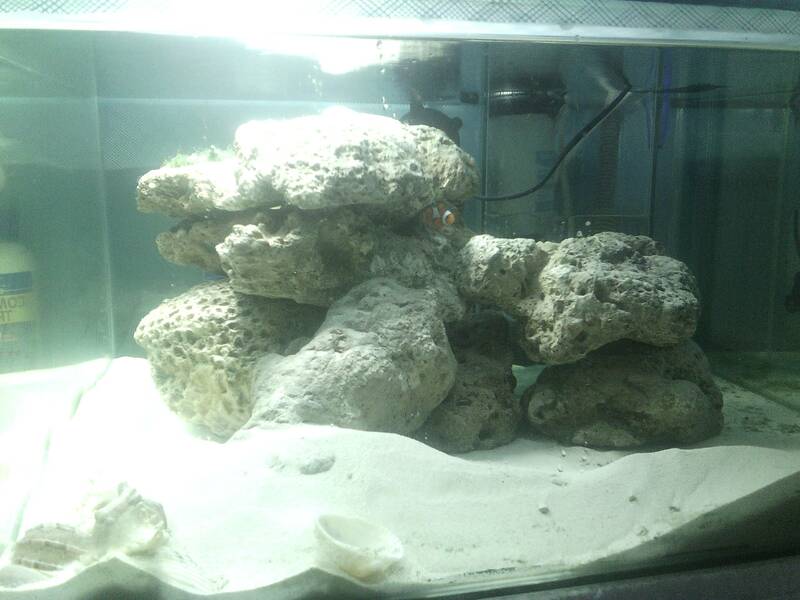 When I come tobecause of it I wonder how different had it been when I kept cichlids and others, except that now I have fancy rocks to pile up instead, coupled with fancy white sand. I like intense colouration. And, when those colours danced about before my eyes it was awsome a feeling. Just a little coralline algae would be like a pinch of salt. In July, 2015, I went and got a 30 gallon square tank with height equal to half it's sides from Buroda. Finish was beautiful. It was to have a moveable little in-tank-sump in a corner for a tiny skimmer, a powerhead to pump out water for the top filter with cotton pads and even a thermostat when needed, to fit in. Then came 10 kg of live rock to sit on the bare bottom for the next one year in the company of a skimmer & a power head only. Kepping those running is crucial to keeping the tank alive, even if it has nothing in it.Then 10 kg of live sand from Redsea followed to cover half the shame of my bare bottom along with 10 more kg of dry rocks. Another few months of macro-algae hunting until "letsplay" offered to give away some. Even then, my algae lump had to be fed sunlight by the window in a mug of tank water renewed every day. My tank was sitting on the floor without any direct light except for the ambient light of the sun. I am guilty of unintentional murder of a tiny brittle star from the chaeto algae. Without noticing it, I went and put the algae in the water. I should have drip acclimated. And honestly, I had no idea about the star. You should visit a saltwater hobbyist's tank in person first. That is very important. But, not enough. As, an inexperienced eye will miss out on the important aspects that need to be noticed. Repeated visits along with the hobbyist's tutoring will push you down the right path. All this while my tank was having those beautiful nuisance algae, the browns, the greegreens​, the maroon/red. I had to switch over to an RO water system. Deionizing resins are no where available. And, recurrence of algae continued and it kept covering my sand. It also kept blowing about if I didn't place my newly arrived wave-makers in the right spot & pointing at a direction that would prevent a sand storm. 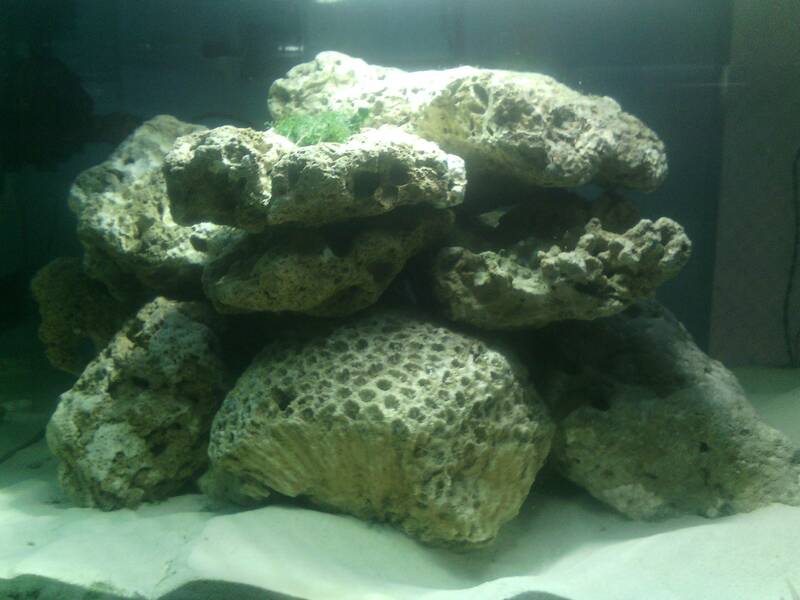 When I noticed that my coralline algae wasn't spreading I knew that my RO water was preventing it. I searched and learnt that my RO water had a lot of nitrate and phosphate. Basically, these two culprits prevent the purple algae from growing. So, I needed Phosban from Seachem to strip PO4 from my tank. Rowaphos is said to be better but too expensive for me. Phosban made a noticeable difference. The water was very clear and tiny spots of coralline began to showup at a few places. The Phosban bag was first placed inside the tank right in front of a wave-maker so as to have the tiny white particles that resemble tiny stone chips to tumble about in the bag as, I was wanting an aggressive removal of phosphate. I also bought a Hailea chiller graded for 150 gallons. Picked it up from the office of indohobby.com at Rs. 20,000. Took a bus to return home with it. Now, 18 months had passed counting from the day I got my glass box. No test kits yet as, I wasn't in any hurry to start a show. But, I got a new Flat for ourselves. Everything had to be shifted and a table for the aquarium was really necessary. Had one ordered to be made from a local guy, who earned his rice by making collapsible gates & such, out of wrought iron and it costed Rs. 1700 or so. Do not use the ones we see at Galiff Street. Their tanks are tiny. Keeping books and files is fine but not an aquarium. I had to change my mind with that & get a decent one. Now time for the lights. I got a thick-wired, 2ft by 1ft net, the ones that have 1" gaps & placed it over the tank hanging it from an L-shaped iron structure welded on one side of the table rising up the tank's back & bending at 90° to reach the center of the tank to have a light hang like a pendant or whatever. Got three led Syska bulbs, two 3watt & one 7watt, from Chandni, to add to the overall brightness (for the human eyes). I was also very anxious regarding assembling of my Cree Led fixture with its adapter, dimmer and a fan fitted sink because I am as dumb as a wall about technical stuffs. The fixture was supposed to have one 430nm, three 450nm, two 470nm, one 490nm, one 660nm & two 7000k epileds. After the wiring it was put over the tank. Bought from kiwilighting.com at Rs. 4000 approximately via PayPal, no extra charges for international shipping, wow. Now, why the dimming switch? Well, first of all, we shouldn't be ill-mannered just because we are dealing with ocean creatures. We shouldn't forget to knock before entering into someone's private space. We need to bring the light intensity up as well as down, very gradually, at day break and bed time respectively. That is what has been happening in the reef environment since the beginnings. For some reason, the Creator chose not provide eye lids to fishes. This is why it is all the more necessary to mimic sun rise and sun set as closely as possible. Sudden transition from darkness to intense light is harmful for the inhabitants of the aquarium, if they are continually subjected to this practise by the aquarist. It must also be noted that, the fishes we usually keep in the beginning, are from the bright reefs, mostly. Therefore, to stick to the plan of mimicking nature, we must provide them with quite bright lighting. Wavelengths are something for the corals only, and the world wide web has it all that we need to know when necessary. It is very important to know this that, low light signifies dawn and dusk, a moment when it is time to get ready to wake up or to seek shelter for the night, to protect oneself from the night crawlers. So, its a time of tension & worries, as no one wishes to become a meal for someone else. Keeping an aquarium in low light is like simulating this dusky period, thus keeping the fishes in continuous tension and fear, resulting in a compromise in their immune system through the process. Now, that is gruesome tortutre, ain't it? The set is yet to receive its finishing touches​ as you can see in how untidy a manner it lies, from the image link above. Before setting up the Cree-epileds I had my first fish in the month of February, 2017. It was a pair of ocellaris clowns/false percula along with an orange tail blue devil damsel. Clowns were 500/- each & damsel was 750/- ( the female devil damsels were 500/- each). Came home, started drip acclimation with a white pipe that we use with air pumps in our goldfish or cichlid tanks. I had earlier used multiple knots to reduce the flow to two drops a second with success but that knot practice is what brought doom upon my fishes. In an event of anemone death, the whole system would crash. Though a poor man's car, a crash is a crash, and it hurts a great deal to loose even a 500/- fish. Alright. Went and got an orange tail blue devil damsel again but, this wasn't orange enough, just a few yellow lines on the tail with the lips, chin, throat, belly fins all yellow. The lonely clown now had a mate, they got along fine. Now, I got a royal dottyback costing me 1000/- after about a month. The devil showed its true self and kept chasing the dottyback away and poor fish took refuge near the digital thermometer. Went for work next day. Returned home and dottyback was heavily injured on its tail & back finage. Tore out the tank to get the damsel out. Never thought of keeping a net. It took a lot to get hold of it with a mug. Kept it in a big bucket with water prepared and mixed with the tank water in order to adjust the salinity to be at par. Work. Home. Found the dottyback had gone completely inside a tiny crevice under a piece of rock prior to which its tail & hind part was visible. It must have been breathing normally at first. As time went by, the fine sand grains must have caused difficulty in breathing and so it crawled forward & went deeper into the rock crevice. The more it went in the more suffocated it got resulting in death. When I took it out, there was sand grains blocking its mouth ang gills. Lessons to learn regarding introduction of a new fish are, always separate the attacker by isolation to let the new fish get comfortable or the new fish be put in an acclimation bag. If damage is done to the new arrival, bring it out and place it in a bare bottom tank or large container with a place for it seek cover like a rock, or PVC pipe or whatever. Do not introduce any substrate in it. Treat it if needed, feed it until recovery. Feeding garlic or food based on it is good for the fish & you. Reintroduce as above. For feeding my fishes I wanted New life Spectrum. 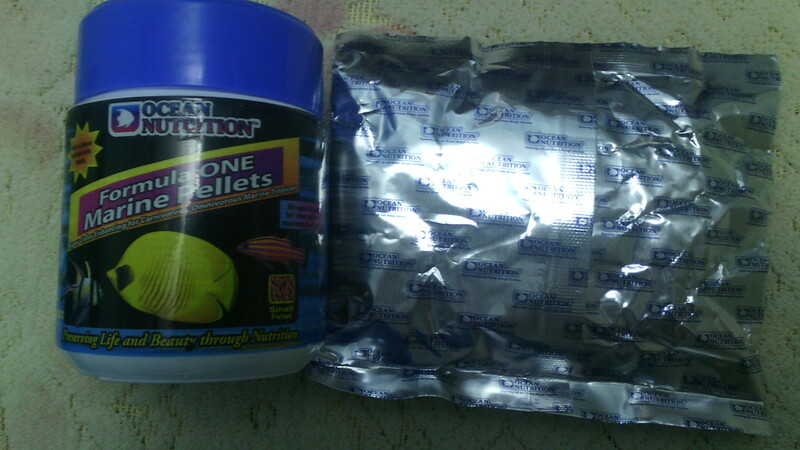 Wasn't available so, had to order for Ocean nutrition, formula one @ 700+ /-. Its not bad given the claim of the contents in its formulation. The added garlic is what I like the most about this food. 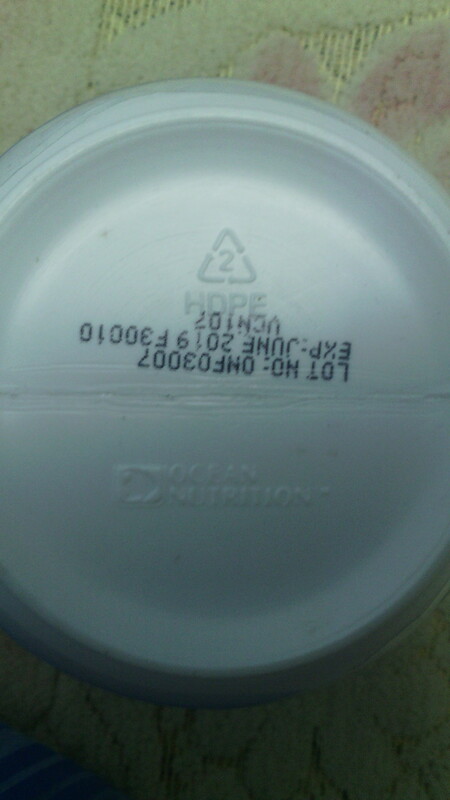 I think the engraved markings on base of the formula one container should be checked during purchase. Usually one or two granules at a time are served to prevent wastage. I have noticed that my blue devil (1 & half inch long) can go on & on no matter how much I gave it to eat but, the clown (little less than 1 & half inch long) becomes disinterested after taking 3-4 granules at a go. The clown seems to regain its appetite after about half an hour. And, I forgot to mention that I have put a plastic net (used on windows to keep away mosquitos) over my tank. My problem fish the devil damsel was shifted to a bucket and it stayed there for four nights. Since I had no acclimation box, I went and made a temporary one out of the above mentioned plastic net, sewing the edges with cotton thread, to house the damsel in my tank. Since it will be 10 more days prior to the arrival of a new dottyback, I therefore decided to not have the damsel stay in a bucket for that long. Here's ​the link if you wanted to take a look at the diy amature acclimation box. The damsel is active in its prison box & gobbled up food but , the sight of its confinement is making me feel really bad. 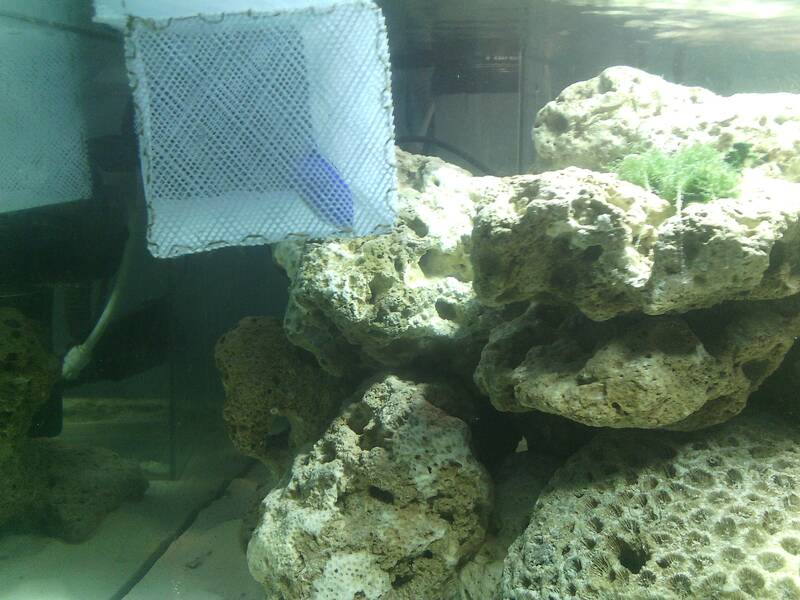 And, it has to stay in there for 14 more days, 7 days prior to the royal dottyback's arrival & 7 after that. Honestly, I never liked this fish & would rather get a royal gramma whose purple coloration was less vibrant compared to the dottyback's, but now I am in love with it due to its candy-purple & the yellow. For now, that's all friends. Last edited by Aayaan on Wed Oct 25, 2017 12:08 pm, edited 7 times in total. Re: Dedicated to would be hobbiests. > Royal Dottyback was bought on 15/04/17 from Jagarani, Behala @ 1000/-. Size = Almost 2 inch. The fish was very alert & quick while purchase. There was no sign of white spots or injury. Its stomach was pulled in a lot and looked quite skinny though. After about two days in my tank it went about looking for food actively and as of now, has become quite bold but not at all aggressive. The little false Percula has begun to pick up food off the tank floor after seeing the dottyback do it. They are good neighbours, I can say. No trouble. The stomach of my dottyback looks normal in shape now. Its body is clean to my bare eyes. My Blue Devil will be released ( with caution ) on 29th of April may be, from its box cage. And, I'll have a whole off-day to be able to keep a watch on the devil's behaviour. Have to ensure that this dottyback is not harmed this time. > My Hailea 150A chiller was hosed up & turned on in the morning today. The tank temperature was between 29-30 degree Celsius. Set the temp. at 28 C. and took about an hour (may be) to reach it. The day was partly cloudy so, did not lower it more than that. Will be lowering the temperature to 27 C the most but, that will be done in two days time (just my decision). Very informative thread. I am on the same side of your opinion that, this salt water hobby is like expensive drug/car addiction . It is so addictive only the salt water immersed person only knows. indracalcutta93 wrote: Very informative thread. I am on the same side of your opinion that, this salt water hobby is like expensive drug/car addiction . It is so addictive only the salt water immersed person only knows. Howz your beautiful tank doing ? A warm hello to all. First, the chiller has been fixed to​ 29°C. Since, its a fish-only-with-(not so) liverocks, with nothing else except for the Chaeto (having now turned into a handful), I am of the opinion that there's no need for the water to be cooler. And, in forty days time my meter reading has been 60 units (given that I have only my wife at home alone the whole day, a single door fridge, LED bulbs in the bathroom, kitchen, drawing room, two bedrooms, three ceiling fans, two exhaust fans, a poor man's LED TV, an RO filter, a 10W pump for the chiller, a cheap wave-maker, a 30W LED with a fan on its heat-sink). Now, I had to be out of station for two weeks. So, I asked my neighbour to see to the feeding of my fishes and the turning on & off of my aquarium electricals (I prefer to give those some rest during the night). This can cause breathing trouble for the fishes if they are too many. howmanyfish.com gives us estimates as to the number of fish that could fit in one's tank without​ over stocking. Very neat stuff. And since, my tank is two foot-by-two foot square without​ the height, it amounts to 12 inch of total adult fish length (2x2x3). So, if I'm considering two false percula clowns and a royal-dottyback for my tank then it should be understood that I am taking into account their maximum adult length/size i.e. they all reach 3 inch the most. But, during purchase, my clown was a little more than an inch and the dottyback about an inch and a half and a little more and, I am not going beyond three of them (I have a devil damsel already in the tank but confined). This way the tank bioload will stay within limits. So, the guy took good care, given that he has fish keeping experience. But I had to tutor him with the baby-sitting of my fishes. When I returned, I was happy to see them all alive but my tank was greener than before. It is what I had expected. On my return the first thing I did was change the wave-maker as it had stopped working three days prior to my return. Always keep a spare. The effect of it was that my lawn of Hair-algae (which I love so much) had gone covered with blue-green algae and weren't dancing in the current. Even the handful of chaeto was cobwebbed with the same. Took their individual rocks out for a good scrubbing. Now the Chaeto are full of glee for getting to be in their favourite swift flow spot and am waiting for the lawn to fill up again which will inevitably happen at my pleasure. Things that I now need to do are: get a spare set of wave-maker, a submersible pump/powerhead, and a decent board for the electric plugs. Since, I'm at home today​, I've let the devil damsel out of it's confinement. The royal dottyback tried to be agressive at first but, a little while later the damsel began chasing the dottyback in its attempt to size its territory. The devil could not​ create much influence on the clown though as, it stood its ground unlike that royal D.
The more the dottyback yields to the devil the worse it is but, one never knows. It will surely take some time to get settled. The clown and the damsel has found peace. Will have to wait and see what happens between the royal and the devil. Re: Dedicated to would-be hobbiests. Hello everyone. Its been some time and the Caulerpa Peltata specimen in the tank has taken over almost every bit of the rock real-estate, thwarting the the other two species. 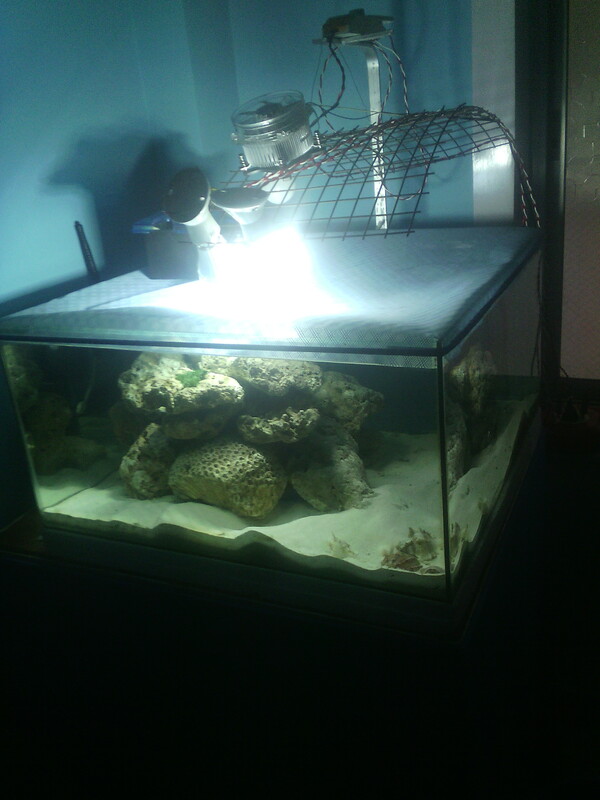 There is a photo attached below for a quick sneak into the present status as it stands till date of my tank. One thing I have noticed is that the nuisance algae is gradually retreating. And that should indicate that the level of various toxic chemical compounds in my tank water is become very low in availability. Good news. Way to go. Patience.